The Twitter winner for our @tomtoc_official #NintendoSwitch gray case giveaway is @Dunkster200! Congratulations! Facebook winners will be announced later today. Hey everyone! Welcome to NintendoSoup’s 34th giveaway! This week, we’re giving away three tomtoc slim hard cases for Nintendo Switch! These cases come in three different colors – Red, Black, and Gray. You can win Red/Black on Facebook, and Gray on Twitter. We’ve also teamed up with tomtoc to offer an exclusive 20% discount for all of their Nintendo Switch accessories – check it out here. To enter the giveaway, simply head over to Facebook and/or Twitter. Win a gray slim hard case for #NintendoSwitch! 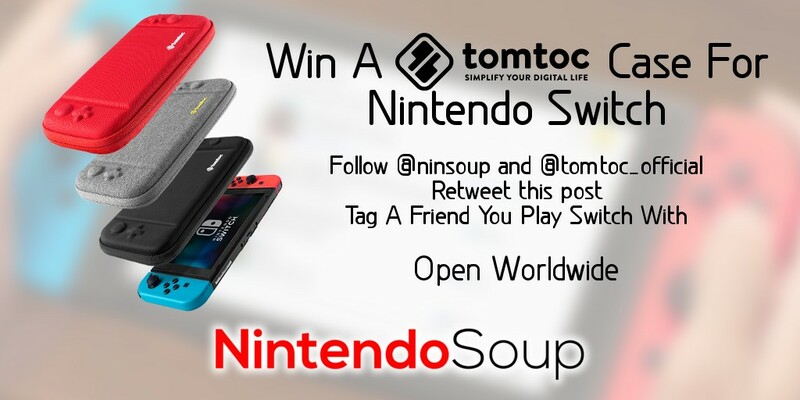 Follow @ninsoup and @tomtoc_official, RT, and tag a friend you play Switch with. Open worldwide, ends Oct 15, 6am PT. Giveaway ends October 15, 2018 6:00am Pacific Time. 2 winners will be randomly picked on Facebook, and 1 on Twitter. Open to everyone worldwide.